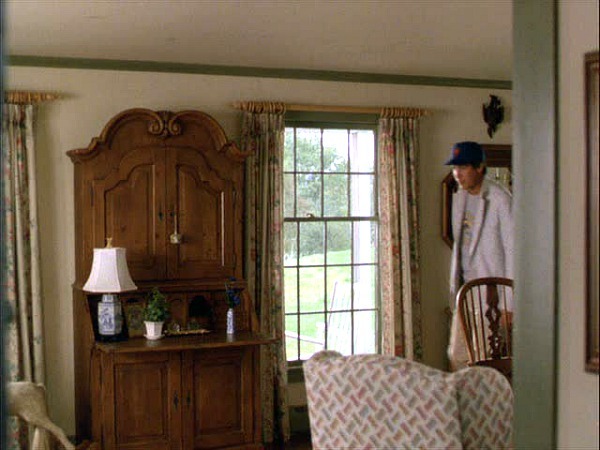 In the comedy Funny Farm, Chevy Chase plays Andy Farmer, a sportswriter who quits his job and buys a house in the country, where he plans to write a novel. 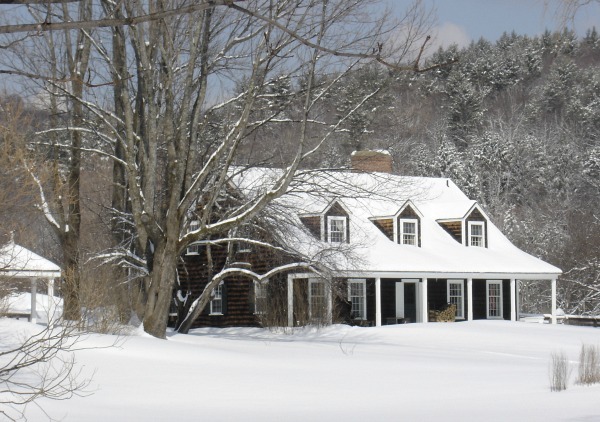 The movie takes us through all four seasons in the small town of Redbud, Vermont, but it ends during the holidays when the Farmers’ charming Cape Cod is decorated with white lights and covered in snow. Funny Farm was based on a comedic novel by Jay Cronley (now out of print, but I managed to find a used copy online, and it’s hilarious). Andy and his wife Elizabeth think life will be perfect and peaceful in Redbud, but things go wrong from the start. The fact that he has writer’s block is the least of his problems. 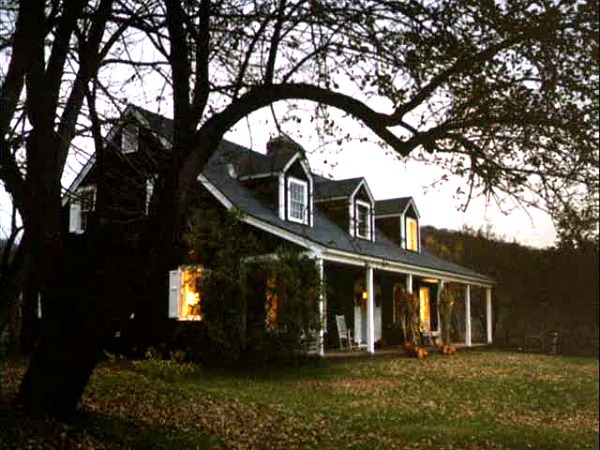 The house is a simple Cape Cod that sits (in real life) on a pond in Grafton, Vermont. 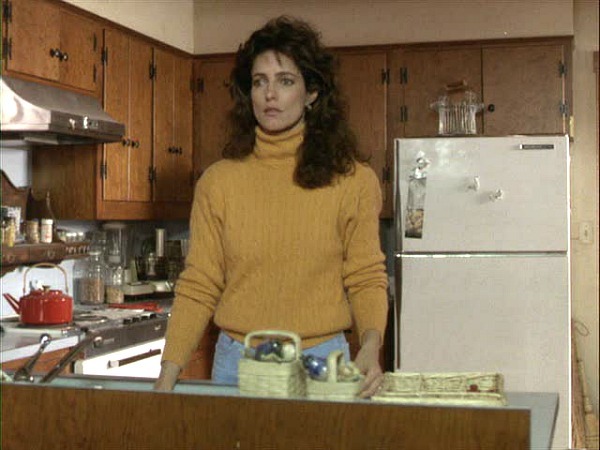 Madolyn Smith (Elizabeth Farmer) kind of disappeared from Hollywood after making this film. I think it’s time for her to stage a comeback! Andy’s working on a novel called “The Big Heist,” but while he’s not making much progress on it, Elizabeth writes and sells a children’s book about a squirrel who moves to the country. 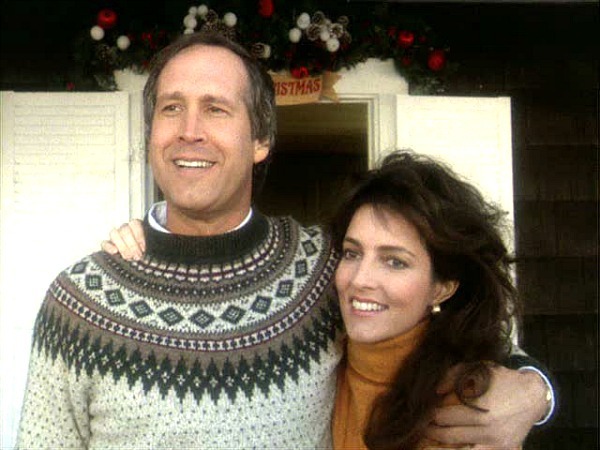 In 1987, the Chevy Chase film, “Funny Farm” was being filmed in the area and a local citizen’s home was used for the movie character’s house. 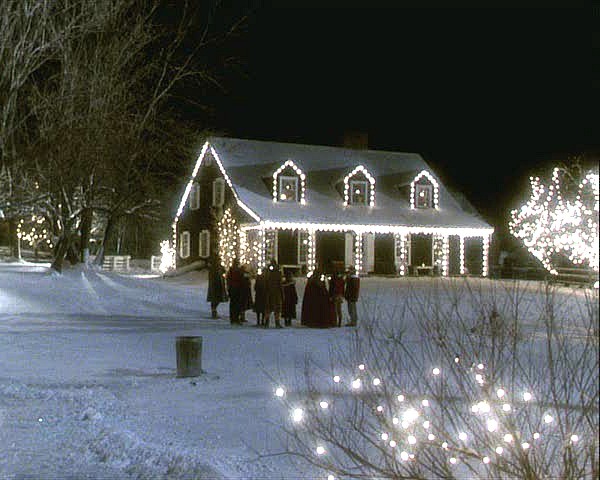 The film crew meticulously decorated the building and lawn for winter, complete with plastic snow and icicles, cotton batting over rooftops and fences. The next day eight inches of heavy wet snow fell. The filmmakers built the gazebo for the movie and the community liked it so much that they kept it. Thanks.. we loved this movie! We have loved and laughed over the postman ever since we first saw this movie! and watch it at least once a year now. The postman is a hoot!!! 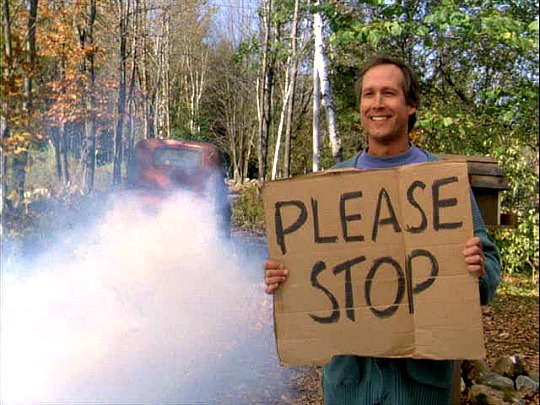 and Chevy Chase? Gotta love each and every film the man is in! And the video with Paul Simon “You Can Call Me Al” is yet another stroke of laughter from this awesome actor!! .-= Nancy Hood´s last blog ..Our Mississippi Babes & Christmas! =-. Oh, thanks for sharing! This is one my Hubby’s favorite movies. I think he’s becoming hooked on your blog too. We browsed through all your movie links last night…love them! .-= Lisa@DestinationSeaborn´s last blog ..Holiday Open House =-. 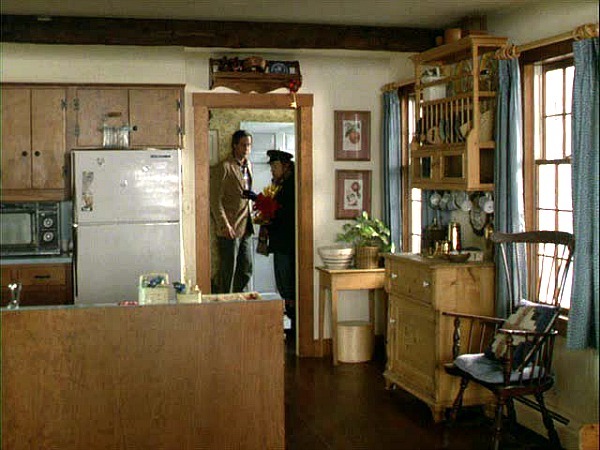 I love Funny Farm…I’ve wanted that house since watching the movie when it first came out…and yellow dog…omg, I now have a yellow dog but she’s not as laid back. .-= Kelly Ann´s last blog ..Weather is Strange =-. My husband and I LOVE this movie. Whenever we get tired of the hustle and bustle of city life, we always say we want to move to Red Bud. 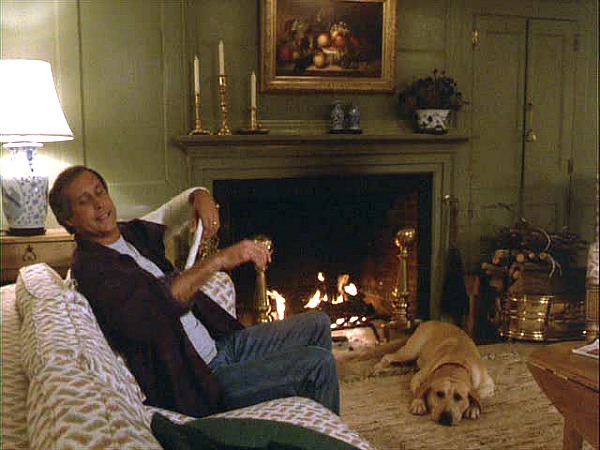 And when we retire, we want a dog just like “Yellow Dog”. .-= JeanetteS´s last blog ..Intaglios… =-. I haven’t thought about this movies in so long! I am definitley going to put it on my list of movies to see again soon. .-= Stacy@RedDoorHome´s last blog ..Flower Frog Fun =-. I have never seen this movie, but I love the house. I dream about having a home on lots of property someday. I think it would be cool to live in a town or community where everyone’s friendly and kind. I absolutely love your blog ! It’s great to see all of the houses that I adored in so many movies and tv shows. I would LUV to see the houses in The Stepford Wives movie with Nicole Kidman, if you can post them !!!!!! Thanks so much ! After being in extra holiday crowded Manhattan today I think I’,m ready to move to Red Bud too Julia! 🙂 This was a funny and sweet movie. Hope you had a joyful holiday and that 2010 will bring all good things your way! .-= The Little Red Shop´s last blog ..~ Glad Jul ~ =-. Give me the house: I will Up date it and make it beautiful again ! Love your posts always. Well done again. Thank you. .-= Godeliva´s last blog ..Prikkel arme omgeving in huis ……… =-. ps. Julia, could you do “Fanny and Alexander” somewhere in 2010 ? Geesh I loved this movie, and I am such a big fan of CC, I think he can pull any humour off, he’s amazing!!! Great post! .-= Annie@A View on Design´s last blog ..Sensational Soverign Islands =-. 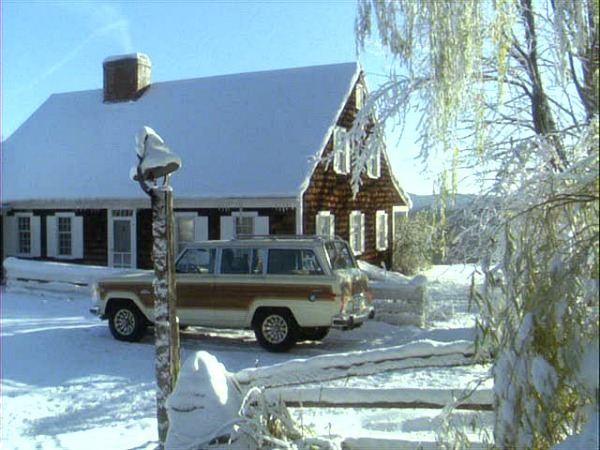 I love the house in this movie! Always have. Its just beautiful. .-= MamaHen´s last blog ..Christmas Eve =-. .-= susan´s last blog ..The Day After Christmas =-. Great post! So many great photos, but I love that first photo with all of the lights, the second photo, and the photo of the antique shop. Have a good week! .-= pk @ Room Remix´s last blog ..Christmas Ornament Lamp – Use it All Year =-. I would love to see what it looks like now. Maybe someone who knows will send you pictures of updates on it. Great job, Julia! I loved that movie!!! Thanks for taking me back~ Happy New Year! .-= susie harris´s last blog ..Paint….Say it aint’ so…. =-. 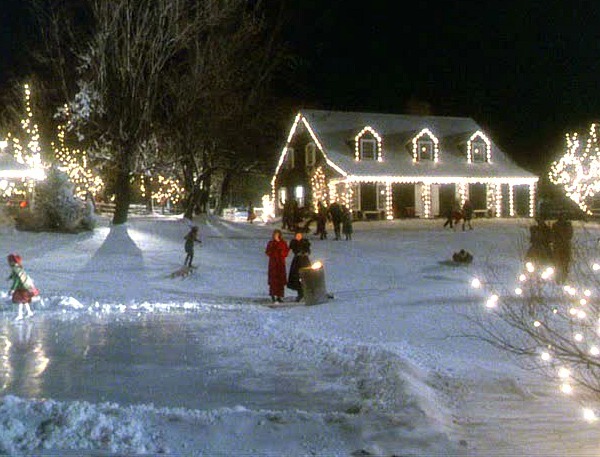 Love this movie..love this house…love everything about it! It’s kind like an updated version of Mr. Blandings in my mind, although nothing will ever top Mr. Blandings! My inner house lover pictures myself right there with yellow dog and all! Love the house! Love the movie! What is the location of this house? Where are Sid’s Hideaway Bungalows featured in this movie? You did not show them. Do you have them? Vermont is a great state to love in or visit I believe. Too bad a second movie was not made with the child she was expecting in Vermont. Does anyone live in this house now? Maybe they would rent it out again and Chevy and his wife would star in it, too. Love seeing all the houses on your site. Some of them are really cool!! Hate the idea that some of them was destroyed after filming though. The Funny Farm house is GREAT though. As was the movie. Don’t forget about the bungalows. Maybe you could feature them and connect it to the Funny Farm site and vice versa. Love what you do! How do you find these pictures? Feel free to e mail with these answers if you want. Happy New Year! Castleton is further south than Grafton, near Lake St. Catherine (a great swimming/boating place in summer…possibly where Andy loses his fishing buddies?). My husband and I went there for our honeymoon (yes, we’re both into fishing and camping) but it rained at Lake Bomoseen’s State Campground where we had reservations. So, about 2 hrs. and a couple bottles of rum later) we rolled into the hotel at Lake St. Catherine. NOTHING stays open in VT past 8 PM! 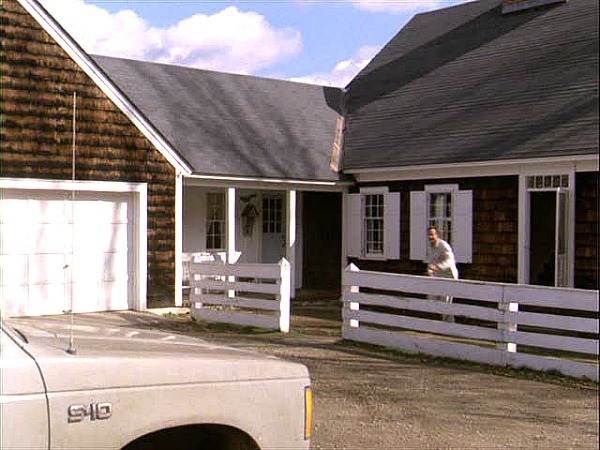 My sister lives just down the road from Groton, in a house eerily similar to the one in “Funny Farm” (decor, pond, hillside and all!). The town of Groton is classic VT (on route 302-E-W). There are three excellent campgrounds/VT state parks on the three lakes to the north of town (no doubt where they filmed some of the movie–Lake Groton is the biggest). The entrance is about 5 miles from Interstate 91 and roughly 4 hrs. from the MA/CT border. Groton and its environs are actually closer to and have more in common with the White Mountains of New Hampshire, but don’t tell a Vermonter that! The quaintness pretty much stops around White River Junction (or Bradford, depending on your definition of quaintness). 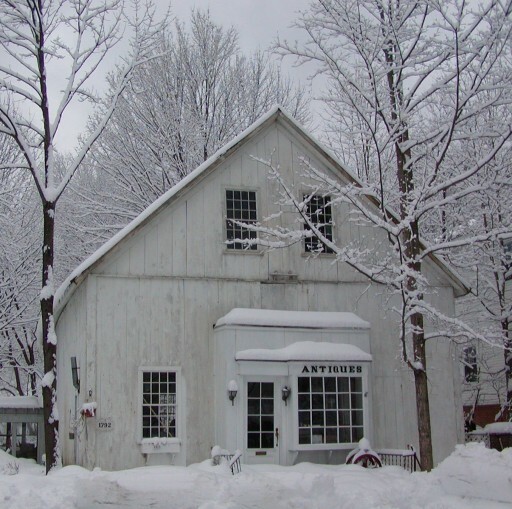 If you want the kind of friendly, pretty, well-kept town and neighborly attitude you are shown (by LA filmmakers) in “Funny Farm”, stay to the south (visit the “Antique Shop” in Townsend, just outside Brattleboro. The next town south, Newfane, has a HUGE fleamarket each weekend, well worth visiting. Townsend itself has a spotless State campground and swimming area. Both towns are on Route 30 and are so civilized that many Vermonters don’t consider them to be part of the state! Great movie! 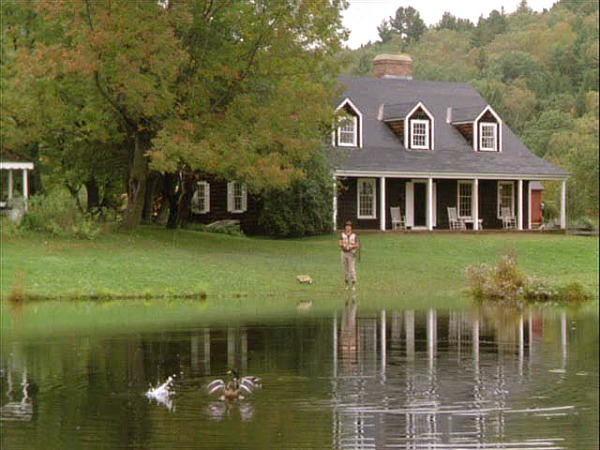 FYI, the lake scenes for the fishing derby were shot on lake Bomoseen and Sids Hideaway Bungalows were located in Castleton Vt. I am not sure if they are still there, but they were in 1995. .-= ichabod´s last blog .. =-. I’m not sure where ichabod got his information about the fishing derby lake scene, but it was not filmed on lake Bomoseen. 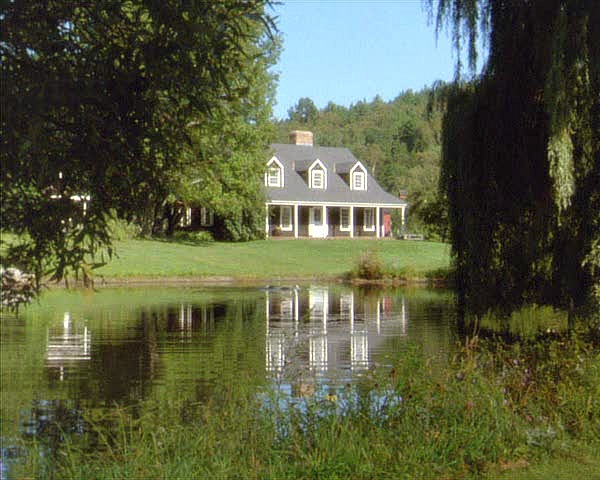 It was filmed in Windsor Vermont on Mill Pond or Kennedy’s Pond. It still looks very similar. It is not set up with picnic tables like in the movie and the small dock is not there. A local told me that motorized boats are not allowed on the lake. When I was there (06-10-10) I saw people in kayaks and people fishing. I think people still swim there also. I’m not sure about Sid’s Hideaway Bungalows. I went to Castleton and asked some people in a general store and in the post office and no one knew where these could be anywhere around Castleton. One postman said that it might have been torn down, but he wasn’t for sure. If anyone out there knows exactly where these are please post it on here. FYI, the softball game field and the fishing derby lake are only about 6 miles apart. The softball field is in Hartland and it is still a ball field. 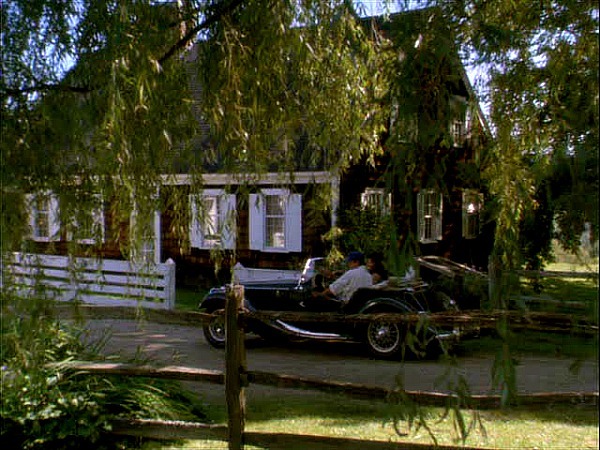 The big tree that Chevy walks by after getting his hotdog is still there and is recognizable as the one in the movie. The duggouts look different and the backstop fence is a little different. 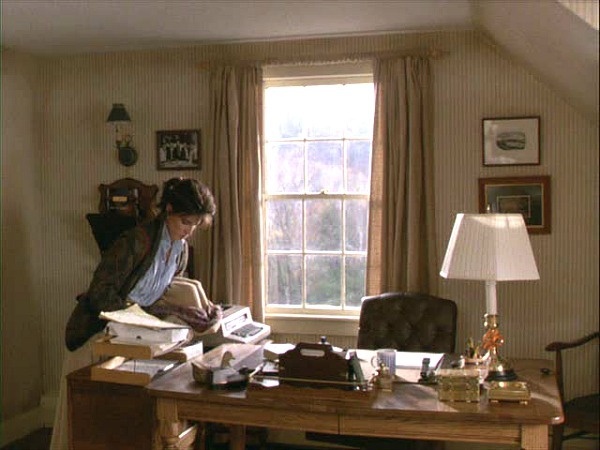 There is also a huge library directly behind the backstop that wasn’t built when the movie was made. I also found the antique store and it is still an antique store! 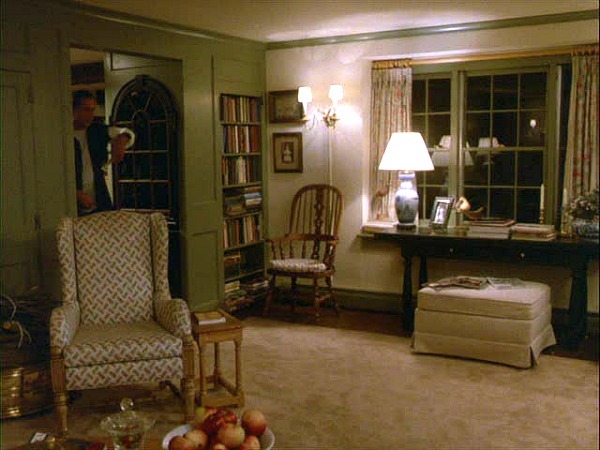 The house is also basically the same as it was in the movie. The road that the mailman drives down past the driveway is nothing but grass now. I’ve had a great time finding these places from my favorite movie. Thanks for the synopsis! I really need a pond and a cedar shake house. .-= Trish@TheOldPostRoad´s last blog ..A Chateau in France =-. Great home and post. Thanks. .-= Nancy Ellison´s last blog ..Twas The Day After Christmas =-. That was fun! With a little updating, I would love to live in that house! .-= Cottage Dreamers´s last blog ..??? daze ??? =-. 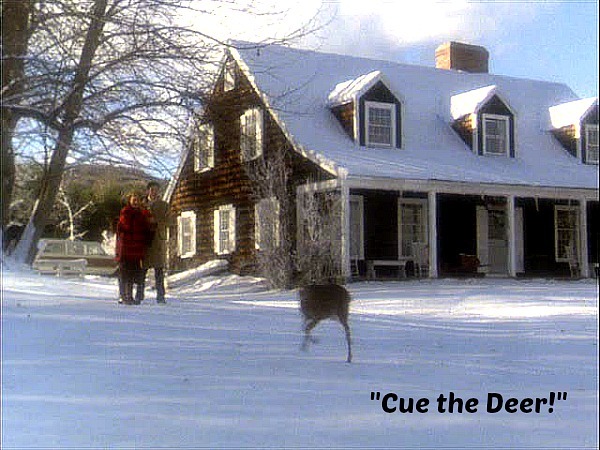 “Cue the Deer” has certainly become a part of my lexicon! Love that house and of course being a Vermonter myself I understand the “dated” deco; we call it “classic”. Happy New Year to you and your family, I loved your video card. .-= Janet´s last blog ..LET IT SNOW, LET IT SNOW, LET IT SNOW =-. I grew up in Grafton and had the privilege of being an extra in this film. I remember the evening in Autumn 1987 seeing the convoy of trucks come into town and set up for the movie. It was quite an event. 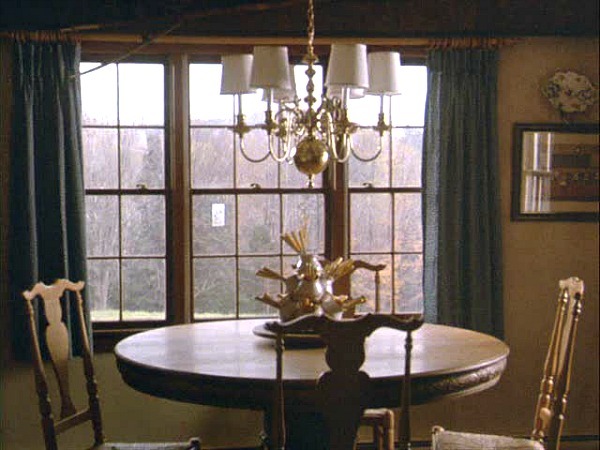 The house that Andy and Elizabeth lived in has always called the Hall House in my memory. That either refers to the original builders or recent owners. I believe it was for sale within the last few years but must have sold since I haven’t seen it in the area real estate listings lately. The house sits on a hill above the village of Grafton at the end of a road just past the village fire pond. In the movies, the postman roars past the house on his rounds but in reality, he would have had to turn around just offscreen. Its a beautiful place sitting on a beautiful piece of land. 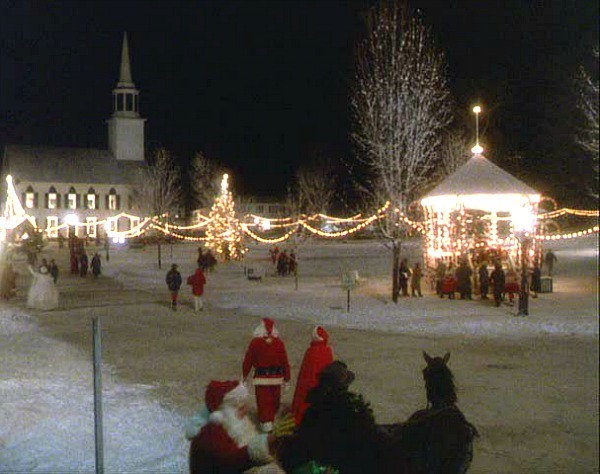 The Townshend village green, where the Christmas village scenes were shot is a 15 minute drive south from the house and Grafton village is a 10 minute walk. Here is the google map image of the property though it doesn’t show the house well. I haven’t seen it in a few months, but as far as I can tell it looks just the same. 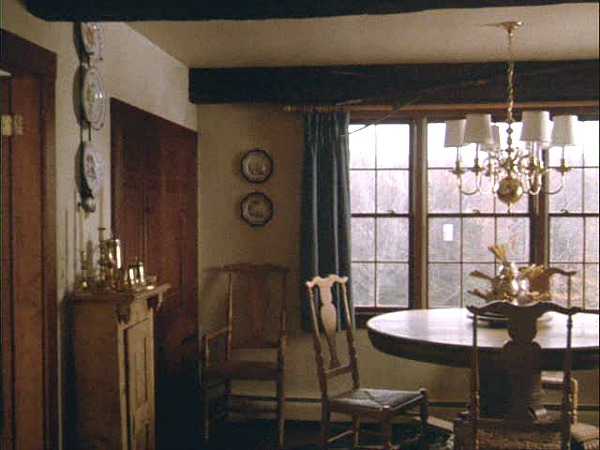 I know at least some of the interior scenes were shot in the house. But I couldn’t tell you if all of them were. .-= cheri peoples´s last blog ..I need you help =-. This is another classic movie! .-= Angela´s last blog ..12 Days of Christmas =-. This is another of our favorites, Julia. We’ve seen it many times! I’ve always loved that house and the setting. .-= Pat@Back Porch Musings´s last blog ..~A Bit of This & That~ =-. .-= Amanda @ Serenity Now´s last blog ..Starting ‘Em Young… =-. I wish to thank everyone who has answered my questions about the house location and Sid’s Bungalows. That is very helpful. Joe, thanks for the map. Hopefully we can get to Vermont for a vacation soon. Joe, it must have been great to have been an extra. You got a spot in the movie, right? That would be so cool! Was it hard to get a part as an extra? Movies are made everyday and I thought of checking it out to be an extra. I wish I could write in that house. I am a published author of 2 children’s books so far with more to come hopefully. Ready to mail my 3rd book to the publisher. I could write in that house for sure! Again, thanks for the information. Will check your site in a few days again. I check it often. Does anyone know the name of the song that is being played in the beginning of the movie? I liked it, too. My hubby got me this movie for Christmas this year. Now I can watch it whenever I want and this makes me very happy! Happy New Year! Yes I made it into the movie as one of the many in the background of scenes. 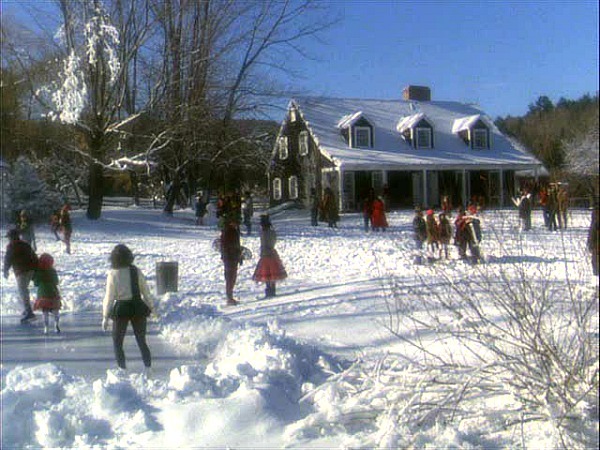 I am one of many dressed in old-fashioned holiday clothing, (corduroy knickers, heavy waistcoat, and a furry hat) during the village Christmas scene shot in Townshend, and playing Frisbee in the outfield of the softball scenes, which were shot in Hartland, VT. I actually couldn’t make it to the winter scenes at the Hall House. I believe I still have my un-cashed paycheck from Warner Bros. enclosed in a book somewhere. I was a senior in high school at the time. This has long been a favorite film wiuth our family and I have always loved the house…it is a classic. I know that most probably see it as outdated now but I would still love it…just like it is!! This was such fun to see…you always give us such wonderful treasures to look at. .-= Susie Q´s last blog ..From Our Home To Yours =-. Where exactly…the building where they pull out from onto the street… are they at when she gets in the car after putting something in the back before they hit the road and they see the movers and the movers are clueless who they are? This is in the beginning of the film. The building looks familiar but I can’t place it. Tried to think of buildings it might be but came up with nothing after a search. My curiosity must be getting the best of me I guess. The Apthorpe Building in NYC. Located at W79th & West End Ave. 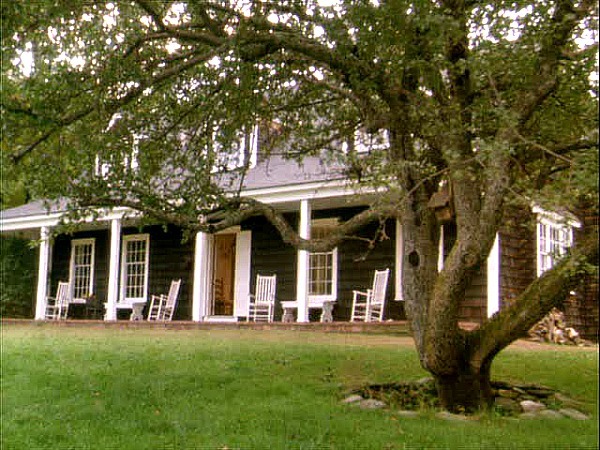 I wonder if I drove to Grafton VT and drove by the house, would I be able to see it from the road? I wonder how many people drive by it and take pictures? funny farm is about my favorite movie. my husband and i loved the house so much we built it with afew updates but we can never find the setting, so even though we have the house its not the same but almost. i hope the owners donot change the house to much. Cindy, do you have floor plans drawn up for this house? 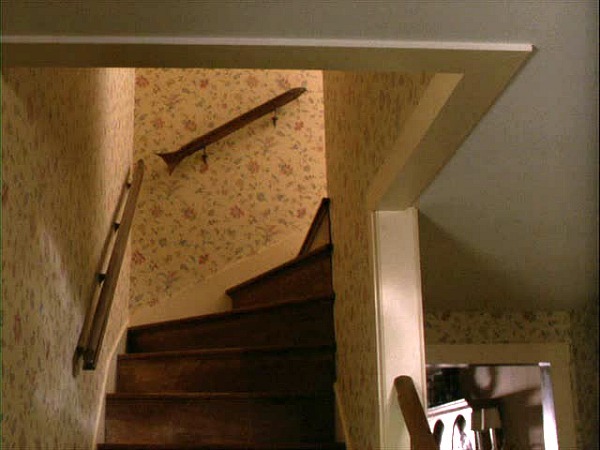 How close to the original house in the movie is your house? I am wanting to build this house as close as I can get it to the original house. I would really like to get a copy of any plans you may have, even if it is just a scetch on some paper. I am currently vacationing in the Grafton VT area and actually took a few pictures of the house from the view over the pond. It looks exactly like it did in the movie. You can contact me at ashleywmoore@hotmail.com. ashley, i have plans but because of present day building code i had to make some interior changes without going much larger as it turned out we have 2800 square feet. i can check with the person who helped me draw up plans if he kept the plans on a disk. we could not find a nice piece of land so we had to build ours in the woods. we also could not do a pond because it 55 feet down to water. but we are looking for the right piece of land and if we find we will rebuild. by the way I love the house. if any more questions you want to know I sent you my email add. My husband and I are looking to build here in So.Vermont, and are currently working with cape house plans, looking to build the Funny Farm house. *We even have a pond! 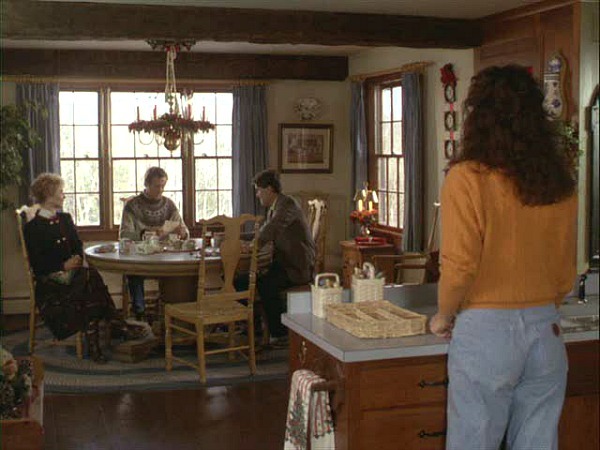 Going by the movie, we have gotten a close representation of the house to go on, but do you have a basic sketch/layout that was a basis starter plan for the house? Does anyone know the name of the picture above the fireplace where children are building a snowman? 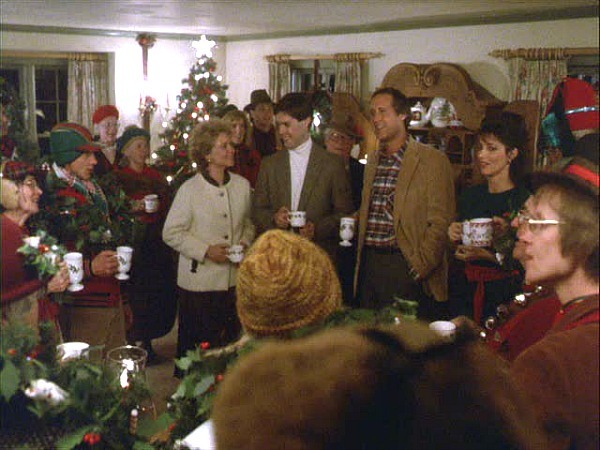 Does anyone know the name of the artist or picture that is hanging over the fireplace during the Christmas scenes. It looks a little child pulling a sled in the winter. Ashley I will send you the pics I have 🙂 I don’t dare go back now to get pics in the summer cuz of the owners request. EEK!! lol! Alyssa, I too live in VT, but about 1 hr 45 min from Grafton. I went this fall, but couldn’t get close enough to get any pics w/o tresspassing. Ashley kindly shared her pics w/ me, but I would love to see your winter shots as well. I know what you mean about feeling sometimes like you live in Redbud. I can see where they got the ideas for many of the characters (taken to the extreme of course). Really we have found the folks around here very warm and helpful ! Anyway, if you wish to share the pics my email is tsdomas@comcast.net. Thanks! The comparisons that you have are great. I’m not sure how much of a coincidence they are. With Chevy being in them both, maybe they had some of the same writers. Oh, and one thing, you said Chevy got chased by an eel, I believe that it was a black snake that he caught in his pond and it slithered into his house that you are thinking of. I love this movie and watch it every Christmas. I love this house with all it’s furnishings and decor. This is back when houses had charm. I find all these new kitchens with all of this granite, new cabinets, fancy sinks, new tile floors etc. too cold. What’s wrong with kitchens like this? Not outdated just charming!! The whole house inside and out is simply charming!! I think I found the house location using Google Maps, anyone want to confirm? It does look like it could be–good detective work, Aaron! Does anyone know for sure? Yes, you found it! The owners do not want anyone trespassing however, and they have a sign up at the end of the drive, which is quite a bit down hill from the house. You can’t actually drive up near the house as the mailman does, due to that portion being private property. The tops of the dormer windows are just visible from the end of the driveway, but that’s all you can see from that point of view. It’s unfortunate (though not for the owners I guess) that more can’t be seen from the road. Thanks for confirming it, Sue! I have always loved this movie and watch it whenever I want to relax – take a nap afterward on the sofa. I love the scenery and the home – it matches what I think of as a “home.” It’s a “shingle house,” and I am wondering what year it was built. Looks a little Craftsman, with the shingling and window trim on the outside. I agree that these HGTV gotta-have houses are getting very cookie-cutter with their granite countertops etc…everybody has to have what the next guy has. I’d grab this house in a heartbeat – it’s “lived-in.” A real home. 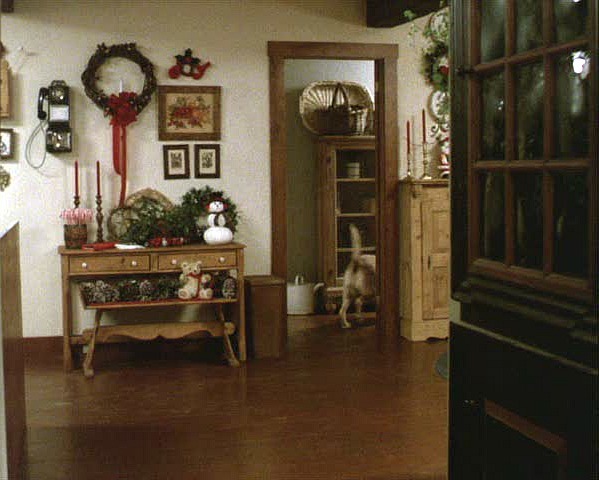 I get a home-y feeling of comfort when I watch the movie and can smell the cinnamon and Christmas cookies when I see those scenes. 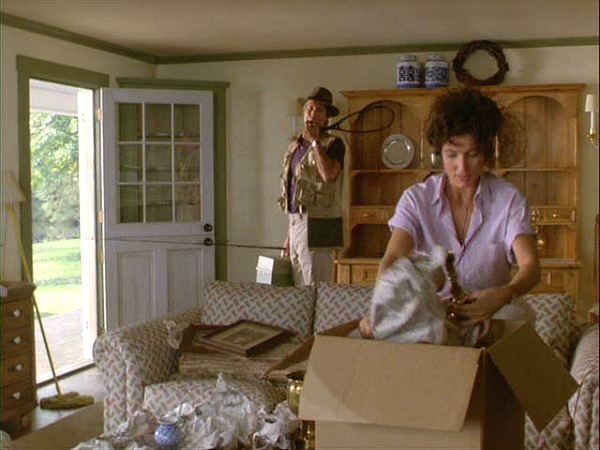 I also love the man sitting on his porch in the beginning of the movie – giving directions to the movers. That red color of his house is so pretty, with the white trim, wood chairs and flowers – looks great in the VT countryside! I think of this movie when I watch reruns of “Newhart.” Was Funny Farm possibly the inspiration for the show, with the people and the Inn etc?